Vinyl siding has grown to become a leading wall cladding product for residential re-siding projects thanks to its low cost, ease of installation and durability. Vinyl and metal siding is also available in a wide range of colors, giving homeowners many different options to suit their style. However, the color in vinyl and aluminum cladding products can fade over time, especially on walls directly exposed to the sun or wind. In another scenario, the siding colors are in good condition -- except that you hate the palette used by the previous owner of your home. 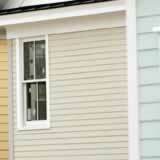 You can paint your siding in colors you choose; there are many new options for siding color trends. Before you head to your local home improvement store to pick up a few gallons of paint, consider this advice. There is some debate about the effectiveness of repainting vinyl and aluminum siding. Even high-grade vinyl cladding products may fade in 10 or so years -- especially for deeper colors. Check manufacturer information on warranties regarding color fading and also warranty terms if vinyl siding has been re-painted. It's all in the product. Cheap exterior paint just won't cut it. Opt for a premium exterior paint such as Valspar Duramax, which is 100 percent acrylic latex. This paint is designed to cover a wide range of wall coverings, including new aluminum and vinyl siding. It also comes with a lifetime warranty against cracking or peeling and is self-priming. This is but one example; there are many other similar products on the market. Paint supplier Benjamin Moore makes a line of 60 different colors specifically for painting vinyl and aluminum siding. Prepare the surface. The paint must be applied on surfaces free of dirt and grime. Remove mildew and accumulated buildup with a water and bleach solution, and scrub especially dirty areas. Color matching. Your best bet to solve faded colors is to try and closely match the original color of the cladding. You are less likely to notice imperfections or fading as the new paint ages if you stick with similar vinyl siding colors. A professional painting contractor also might be a better option than doing it yourself. Painting isn't rocket science, but the pros have much more experience and are more likely to do the job correctly.